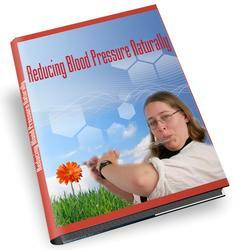 Many diseases result from the dysfunction of cells located outside the cardiovascular system. Thus, for a drug to exert its therapeutic effects, it must exit from the central circulation and interact with its extravascular-extracellular or extravascular-intracellular target(s). This process of transvascular exchange is called extravasation, and it is governed by the permeability of blood capillary walls. The main biological features that control permeability of capillaries include the structure of the capillary wall under normal and pathophysiological conditions and the rate of blood and lymph supply. Physicochemical factors (of drugs/macromolecules) that are of profound importance in extravasation are molecular size, shape, charge, and hydrophilic-lipophilic balance (HLB) characteristics. The structure of the blood capillary wall varies in different organs and tissues (53,54). It consists of a single layer of endothelial cells joined together by intercellular junctions. Each endothelial cell, which, on an average, is 20 to 40 |im long, 10 to 15 |im wide, and 0.1 to 0.5 |im thick, contains 10,000 to 15,000 uniform, spherical vesicles called plasmalemmal vesicles. These vesicles range in size between 60 and 80 nm in diameter. About 30% of these vesicles are located within cytoplasm, while the remaining 70% open on the luminal side of the endothelial cell surface. Plasmalemmal vesicles are believed to be involved in the pinocytic transport of substances across the endothelium (53). Because they contain low density of anionic sites, plasmalemmal vesicles have also been suggested as the sites where extravasation of anionic proteins occurs (53). Fusion of plasmalemmal vesicles leads to the formation of transendothelial channels. The endothelial cells are covered, on the luminal side, with a thick layer (10-20 nm) of a glycosaminoglycan (GAG) coating. This layer continues into the plasmalemmal vesicles and into transendothelial channels, and is believed to be involved in cell adhesion, the stabilization of receptors, cellular protection, and the regulation of extravasation. It also provides microdomains of differing charge or charge density on the endothelial cell surface. On the external side, the endothelium is supported by a 5 to 8 nm thick membrane called the basal lamina. Below the basal lamina, a connective tissue lining called the adventia lies. Depending on the morphology and continuity of the endothelial layer and the basement membrane, blood capillaries are divided into three types: continuous, fenestrated, and sinusoidal (54). A schematic illustrating the differences in their structures is shown in Figure 4 (55). Continuous capillaries are common and widely distributed in the body. They exhibit tight interendothelial junctions and an uninterrupted basement membrane. Fenestrated capillaries show interendothelial gaps of 20 to 80 nm at irregular intervals. Sinusoidal capillaries show interendothelial gaps of up to 150 nm. Depending on the tissue or organ, the basal membrane in sinusoidal capillaries is either absent (e.g., in liver) or present as a discontinuous membrane (e.g., in spleen and bone marrow). Numerous variations in the microvasculature bed (i.e., arterioles, capillaries, and venules) exist, which can affect permeability. For example, venular portions of the capillaries have thin endothelial cells (170 nm), with frequent interendothelial discontinuities. The gap in about 30% venular junctions is about 6 nm. Arterioles, in contrast, have endothelial cells that are linked by the tight junctions and communicating junctions, whereas the capillary endothelium contains only occluding junctions. Communicating gaps are small and rare in muscular venules and are absent in capillaries and pericytic venules. Endothelial cells in capillaries have more vesicles than those in arterioles (1000/|im3 vs. 190/|im3). The intercellular sealing is strong in arterioles, well developed in capillaries, and particularly loose in venules. Furthermore, capillaries and venules have more transendothelial channels. The transport of macromolecules across endothelium has been extensively reviewed (53,56,57). Macromolecules can traverse the normal endothelium by passive processes, such as nonspecific fluid-phase transcapillary pinocytosis and passage through interendothelial junctions, gaps, or fenestrae, or by receptor-mediated transport systems. Passive extravasation is affected by regional differences in capillary structure, the disease state of the tissue or organ, the number and size of the microvascular surface area, and the physicochemical characteristics of the macromolecules. In general, the transfer of macromolecules across endothelium decreases progressively with an increase in molecular size. Low molar mass solutes and a large number of macromolecules, up to 30 nm in diameter, can cross the endothelium under certain normal and pathophysiological conditions (37). For proteins, the threshold restricting free passage through the glomerular endothelium is at a molar mass between 60,000 and 70,000. Molecules with a molar mass of greater than 70,000 are predominantly retained in the blood until they are degraded and excreted. Certain hydrophilic polymers, such as poly(vinylpyrrolidone) (PVP), dextran, PEG, and N-(2-hydroxypropyl)methacrylamide (HPMA), exhibit much greater hydrodynamic radii compared with proteins of the same molar mass, and consequently, the threshold molar mass restricting glomerular filtration is lower than that for proteins (25,000 for PVP, 50,000 for dextran, and 45,000 for HPMA) (58). 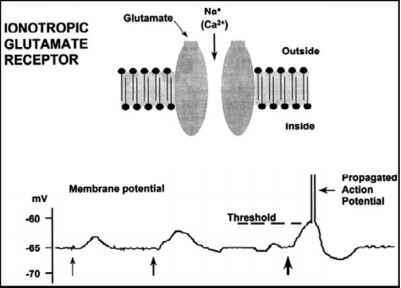 Because of the presence of anionic sites on the endothelium and on the glycocalyx layer, anionic macromolecules show a significantly slower rate of extravasation compared with neutral and cationic macromolecules (59-61). Regional differences in the capillary structure and the number and size of the microvascular surface area determine the flux of macromolecules in the interstitium (37). For example, organs such as the lung with very large surface areas have a proportionately large total permeability and, consequently, a high extravasation. Renal endothelium has a thick basement membrane and contains anionic groups (on the epithelial surface) and heparin sulfate proteoglycan (on the basement membrane). Thus, extravasation through this membrane largely depends on the charge, shape, size, and lipophilic-hydrophilic balance characteristics of the macromolecules. Intestinal endothelium, although fenestrated, is highly restrictive to passage of macromolecules. The absolute rate of extravasation varies considerably from one region to another within the alimentary canal. There is a large difference in permeation of solute macromolecules with a radius of less than 6 nm and no decrease in the permeation for molecules with a radius between 6 and 13.5 nm (62). The lung endothelium, which is nonfenestrated and has vesicles with a size of 50 to 100 nm, is more selective to the passage of macromolecules; the lymph/plasma ratio was decreased from 0.7 to 0.25 when the molecular radius of the macromolecule increased from 3.7 to 11.0 nm (63). Skeletal muscle, adipose tissue, liver, and myocardial endothelia all show extravasation as a function of macromolecular size. 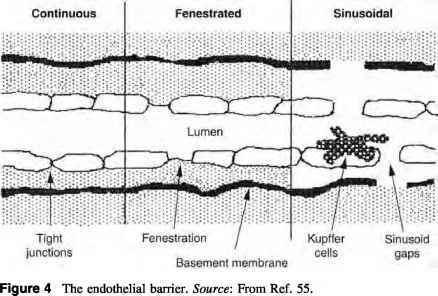 The endothelium of the brain is the tightest of all endothelia in the body. It is formed by continuous, nonfenestrated endothelial cells, which show virtually no pinocytic activity. There are, however, certain regions of the brain (e.g., choroid plexus) that have fenestrated endothelium. Macromolecules, such as horseradish peroxidase, reach the cerebrospinal fluid by this route. Also, certain pathophysiological conditions, such as osmotic shocks, thermal injury, arterial hypertension, air or fat embolism, hypovolemia, and traumatic injury, cause transcapillary leakage and onset of pinocytic activity. This may have some implications in extravasation of macromolecules across the blood-brain barrier. The blood capillaries in solid tumors are dense, disorganized, and tortuous. However, because of increased levels of vascular endothelial growth factor, bradykinin, nitric oxide, and peroxy nitrite, all of which are known to promote angiogenesis and degradation of basement membrane and extracellular matrix, the vasculature in solid tumors is high and leaky. In general, macromolecules with a molar mass of up to 300,000 are capable of extravasation from blood vessels within experimental solid tumor, whereas molecules with a molar mass ranging between 70,000 and 150,000 extravasate mainly from the vascular plexus around solid tumors. The pH within the tumor mass is slightly lower than that of the normal tissue (pH 6.5 vs. 7.4), because of the production of lactic acid and hydrolysis of ATP caused by the hypoxic conditions (64). The changes in the permeability of capillaries as a result of inflammation are believed to be due to the effect of histamine, bradykinin, and a variety of other mediators (56). Damaged capillaries, in general, show increased openings (ranging in size between 80 and 140 nm) in the endothelium and, hence, increased transport activity. Inflamed tissues also show changes in the glycocalyx layer (lining the luminal side of the endothelium), which causes increased vesicular trafficking and, consequently, increased extravasation of blood-borne materials. Other factors that can affect extravasation include metabolic changes, which are mediated through a reduced oxygen concentration and an increased carbon dioxide concentration. Soluble macromolecules permeate the endothelial barrier more readily than particulate macromolecules. The rate of movement of fluid across the endothelium appears to be directly related to the difference between the hydrostatic and osmotic forces. Receptor-mediated transport systems include both the fluid-phase and constitutive and nonconstitutive endocytosis or transcytosis. Ghitescu et al. (65), using 5-nm goldalbumin particles, showed that particles are first adsorbed onto specific binding sites of the endothelia (examined in lung, heart, and diaphragm) and then transported in transcytotic vesicles across the endothelium by receptor-mediated transcytosis and, to a lesser extent, by fluid-phase processes. In case of LDLs, it was reported that particles pass through sinusoids, enter the space of Disse, and then are processed into the liver hepatocytes after interaction with the apolipoprotein ligands located on the surface of the hepatocytes (66). These results suggested that particles can be directed to other cells in the liver by altering the surface with ligands specific for the plasma membrane of those cells. Table 2 lists various receptors and the cells that have them.